I remember darkness. I found darkness in the Appalachians … and the Outer Banks … and Tucson … and camping in the Sierras. Two winters ago I drove my son to Mammoth so he could snowboard. I left Los Angeles after work and Levi fell asleep halfway up there. Past Bishop the sky darkened until it exploded with stars. So many stars that the mountains appeared like a cardboard cutout in front of a curtain of lights. I couldn’t remember the last time I had seen them. 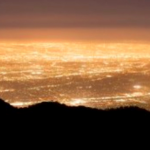 One or two … maybe a dozen … might shine through the dimness of Los Angeles’ eternal light on any given night. But I lost the sparkling magic of a truly dark night when I moved to LA. I miss seeing stars. So when I saw the note for Earth Hour announcing lights out from 8:30-9:30, my optimism got the better of me. 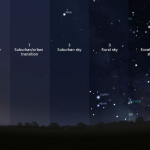 Maybe we’ll see stars! I thought. I went downtown where the LA Department of Water and Power was hosting a lights off gathering, and where the Broad Museum and Disney Concert Hall were going dark. My sister and I stood at the top of Grand Park where we could see Disney Concert Hall down the street and the LADWP building above Dorothy Chandler Plaza. We waited anxiously for 8:30. No? Wait. Yes? Look! 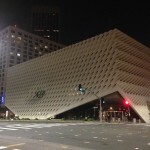 The Broad Museum is dark. Right. But what about everything else? A few facades were slightly darker than they had been a minute ago. 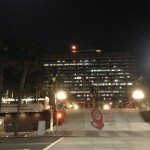 But the office buildings, and LA DWP, and City Hall were still illuminated with office lights gleaming from within. Streetlights still shone, so bright it was hard to make out which building facades were no longer lit. Needless to say, not one additional star surfaced. 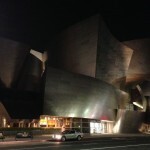 We walked past Disney Hall and saw its lights were off, but its shiny sides glowed from adjacent lights. Beautiful. But disappointing after expecting stars. Driving back to Northeast LA was more promising. 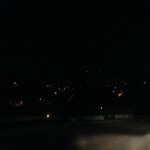 The hills were considerably darker than usual. People were participating. Still … no stars. Fighting for dark skies is about more than saving energy to combat climate change. Nocturnal animals need night darkness to survive. Migrating birds are thrown off course, confused by the artificial lightness of cities. We are confused, too. Our circadian rhythms and melatonin levels are disrupted by electric lights, especially the bluer light of screens and newer energy-efficient bulbs. 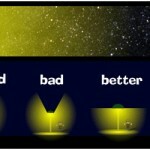 And from a safety standpoint — the primary reason our cities are so lit up — more light doesn’t equal more safety. I’ve had countless moments where too-bright lights disrupted sleep, and vision, sense of safety, and those stars. The nice thing is, we can do something about this. 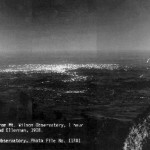 Tucson and Flagstaff, Arizona, protecting the scientific sky studies of their observatories, have protected its dark skies with progressive policies allowing only low light levels from shielded lamps. 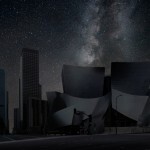 Thierry Cohen‘s Darkened Cities photographs imagine a world where starlight illuminates our urban environments. Wouldn’t it be worth it? What dreams and wishes and wonders and machines have been made seeing stars? Wouldn’t it be worth changing the brightness of our lamps, shielding our streetlights to only shine down, and changing the way we light our buildings and landscapes … to free the darkness and see the stars?